Great buildings are not just well-designed and functional. They make us feel something. They become indelible presences in our personal memories and in our shared history, the sites of important maters big and small. 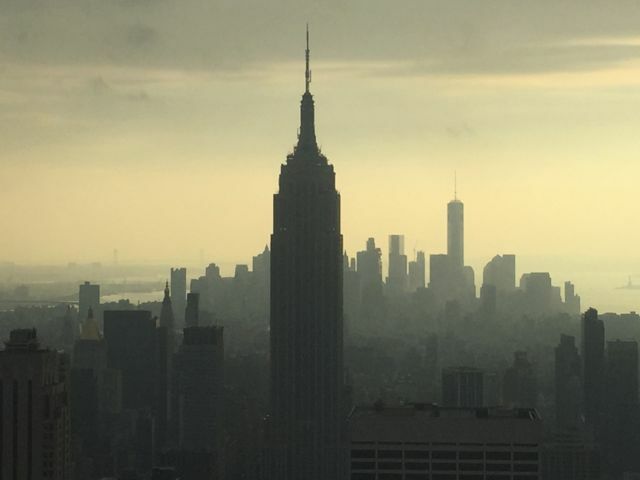 The following list of 25 great NYC buildings should not veer too much from expectations. Most of them would rank high on a list of popular tourist attractions in the city. Three of the buildings are part of the Metropolitan Museum of Art - the main building on 5th Avenue, the Met Breuer (former home of the Whitney Museum of American Art, now in a new building also on the list), and The Cloisters. Some buildings made this list, by and large, for the activity that goes on inside. Great buildings stand as symbols of the times in which they were built and convey lessons to the present. We have lost great buildings, too, and we miss them. When a favorite building or place is altered in any way, renovated or remodeled or left to decay, the shock can be pronounced and profound. 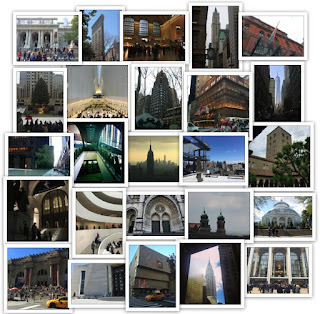 Of course, many great NYC buildings are left off the list. The selection provides a good place to start, though, especially for newcomers and visitors to the city. 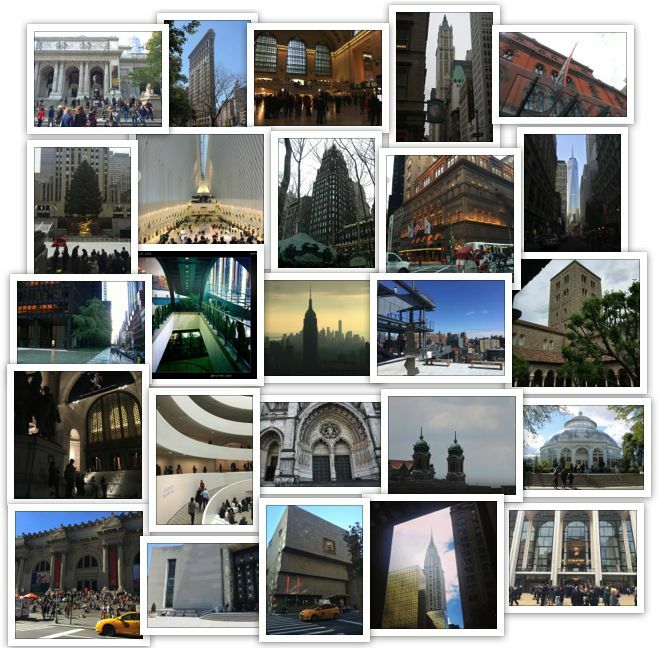 For longtime New Yorkers, you may want to take a look at the list and try to remember the last time you visited these great buildings. So many feelings. 1. The Empire State Building, 350 5th Ave. between W. 33rd and 34th Streets. 1931. Architect: William F. Lamb from the architectural firm Shreve, Lamb and Harmon. Art Deco. When the Empire State Building officially opened on May 1, 1931, three politicians were on hand for the ceremonies held on the 86th floor - former governor Al Smith, Governor Franklin D. Roosevelt, and Mayor Jimmy Walker. From high above the city, Roosevelt gave an uplifting speech about vision and faith, a vision he would take to the whole country. 2. Grand Central Terminal, 89 E. 42nd St. at Park Avenue. 1903. Architects: Alfred T. Fellheimer, John Wellborn Root. Beaux-Arts. This heavenly Beaux-Arts style palace of transit, constructed from 1903 to 1913 and successfully restored in 1998, features grand staircases, chandeliers, and a soaring ceiling vault painted in cerulean blue and decorated with a zodiac. 3. Flatiron Building, 175 5th Ave. 1902. Architects: Daniel Burnham, Frederick P. Dinkelberg. Renaissance Revival. The Flatiron, or Fuller Building as it was known originally, at 175 Fifth Avenue sits on a triangular block formed by Fifth Avenue, Broadway and East 22nd Street. The Renaissance-style building, completed in 1902, tapers at 23rd Street, often creating a wind tunnel. The Flatiron is one of the most romantic and photographed buildings in all of Gotham. 4. The WTC Transportation Hub, vicinity of Liberty and Church Streets in lower Manhattan. The Oculus opened in 2016. Architect: Santiago Calatrava. Contemporary. Part train station (to New Jersey), part shopping mall (unfortunate), part civic cathedral, the hub and its centerpiece, the Oculus, is one of the great centers of contemporary New York. 5. The New York Public Library, 5th Ave at 42nd St. 1911. Architect: Carrère and Hastings. Beaux-Arts. The main Reading Room looks largely the same as visitors may remember, except the overall ambience may feel a tad cheerier, as if the chandeliers, the lamps on the long oak tables, and above all, the books had received a proper dusting. 6. Seagram Building, 375 Park Avenue. 1958. Architects: Ludwig Mies van der Rohe, Philip Johnson (interiors). International Style. Modern. 7. The Metropolitan Museum of Art, 1000 5th Ave. 1874 (original building) Architects: Richard Morris Hunt; also Calvert Vaux; Jacob Wrey Mould. Beaux-Arts. The whole history of art expands from cavernous room to intimate galleries. A day in the museum is a day well spent. See walks nearby. 8. American Radiator Building, 40 W. 40th St. 1924. Architect: Raymond Hood. Gothic Art Deco. When the lights are turned on in the dark building at night, the building seems to glow. In 1927 Georgia O'Keeffe made a painting of it. Look for the building (now home to the Bryant Park Hotel) while in Bryant Park. 9. 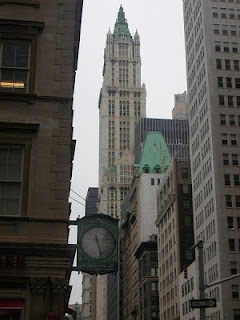 Woolworth Building, 233 Broadway. 1910-1912. Architect: Cass Gilbert. Gothic Revival. The Woolworth Building at 233 Broadway, the tallest building in the world when it was built in 1913, annoyed some modernist architects for its neo-Gothic ornamentation and bothered others for just being so tall. 10. The Enid Haupt Conservatory, grounds of New York Botanical Garden, Bronx Park Rd. Bronx. 1902, with additional renovations in later years. William Cobb with Lord and Burnham. Greenhouse in Italian Renaissance. From a distance, the large Conservatory appears so fanciful it looks like a mirage. Inspired by the Palm House at the Royal Botanic Garden and the Crystal Palace, the great glass greenhouse showcases plants from across the world. The Conservatory is a great warm and humid place in the midst of winter. 11. The Cloisters, 99 Margaret Corbin Dr., Fort Tryon Park. 1938. Architect: Charles Collens, incorporating parts of medieval cloistered abbeys shipped from Europe to New York. Medieval, by and large. Home to the Met's medieval collection, The Cloisters in Northern Manhattan provides a necessary escape from the contemporary city. Slowly walk through the gardens and contemplative spaces, and enjoy the high vantage point overlooking the Hudson River and Fort Tryon Park. 12. The Metropolitan Opera, 30 Lincoln Center Plaza, 1966. Architect: Wallace Harrison, Harrison & Abramovitz Architects. Modern. Celebrating 50 years at Lincoln Center, the house is one of the great opera destinations in the world. Find an affordable seat, watch the chandeliers retreat into the ceiling, and then marvel at the performances and production for the next several hours. 13. United Nations Headquarters, First Ave between E. 42nd St. and E. 48th St. 1952. Recently renovated. Architect: Oscar Niemeyer (overall design). The main building housing the Secretariat is based on a design by Le Corbusier. Modern. The United Nations complex, built in 1949 and 1950 on seventeen acres, symbolizes international utopianism. Like Rockefeller Center, completed a decade before, the buildings were designed by an international committee of architects. Several of the most notable art and architectural features of the General Assembly Building can be viewed for free in the Visitors Lobby, including the hauntingly beautiful Chagall window. 14. 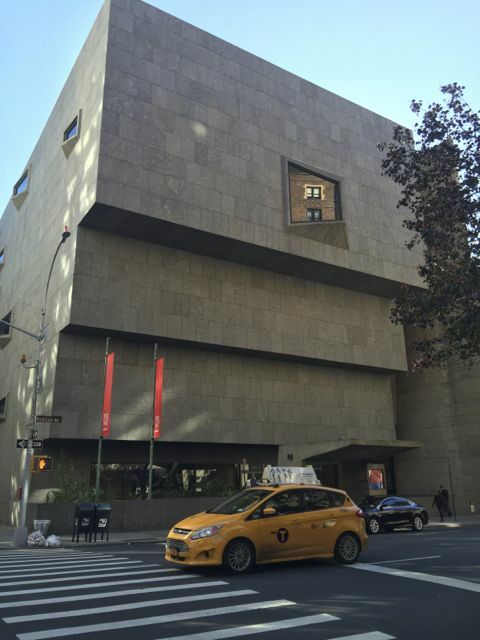 The Met Breuer, formerly the home of the Whitney Museum of American Art, Madison Ave at 75th St. 1966. Architect: Marcel Breuer. Modern. The Metropolitan Museum of Art is leasing the space from the Whitney for eight years to house its growing collection of contemporary and modern art. Marcel Breuer's stairwell is a masterpiece of balanced materials, proportion, and textures, perfectly lit. 15. The Solomon R. Guggenheim Museum, 1071 5th Ave. 1959. Architect: Frank Lloyd Wright. Modern. A building like no other, the Guggenheim often competes with the artwork inside. No matter, because walking the circular ramp makes for an exceptional and uplifting journey. 16. Carnegie Hall, 881 7th Ave. 1891. Architect: William Burnet Tuthill. Renaissance Revival. The world-renowned concert hall built in 1891, while handsome and serious on the outside, is best enjoyed while listening to musicians in the concert halls inside. See short walks nearby. 17. The Public Theater, 425 Lafayette Street. 1853-1881. Architect: Alexander Saeltzer, with later expansions. Romanesque Revival. Home to The Public since 1967, the building was initially built by William B. Astor to house the Astor Library. Then it became the house that Joe Papp built. The Public has produced some of the most extraordinary performance works of our time, including A Chorus Line in 1975 and 40 years later, Hamilton. 18. One World Trade Center, 285 Fulton St. 2013. Building opened in November 2014. Architect: David Childs of Skidmore, Owings & Merrill (SOM). Contemporary Modern. 1 WTC is just one of several buildings constructed on this hallowed ground, a site that includes other towers, the WTC Memorial with its pools in the footprints of the two towers, a visitors center, an observatory, and the transportation hub (noted here). The tower is overwhelming while nearby, but from afar, and under certain light, the building shimmers with confidence and hope. 19. Brooklyn Public Library, Central Library, Grand Army Plaza. 1941. Architects: Alfred Morton Githens and Francis Keally (1935). Art Deco. Built upon a long-lingering initial Beaux Arts building, the Art Deco landmark serves as an important symbol of the literary might of Brooklyn. 20. Chrysler Building, 405 Lexington Ave. 1930. Architect: William Van Alen. Art Deco. Streamline Moderne. 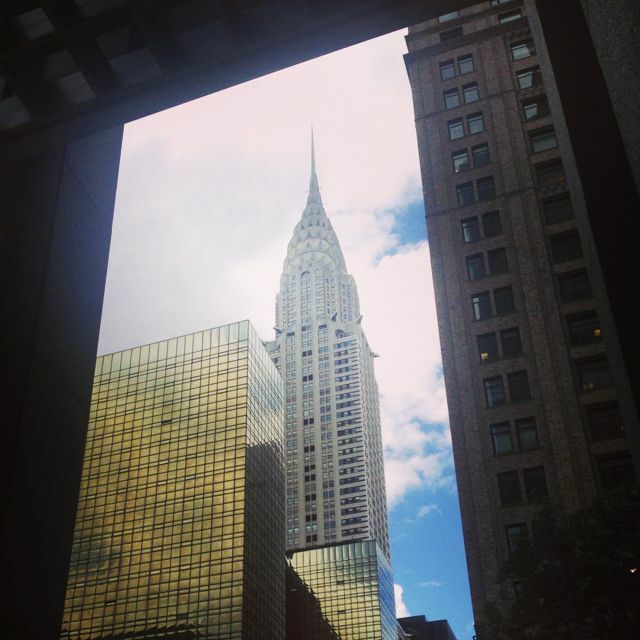 The pretty counterpart to the Empire State Building, the Chrysler Building is an Art Deco masterpiece known for its terraced stainless steel crown. Among many great details are the soaring eagles on the corners of the 61st floor and replicas of the Chrysler radiator caps on the 31st. During weekdays, visit the lobby. 21. American Museum of Natural History, Central Park West at 79th St. 1877, expanded 1888-1908; 1905-1908; 1912-1924; 1927-1932 Architects: (original plan) Calvert Vaux and J. Wrey Mould; (west frontage) J.C. Cady & Co.; and others. Romanesque Revival. A mishmash of architectural styles, the museum also serves as home to a great variety of artifacts, animals, and enormous dinosaurs. It's the place to learn about the history of the planet. Next door, at the Rose Center for Earth and Space, go beyond our planet and discover the universe. 22. Rockefeller Center, from 48th St. and W. 51st Streets, between 5th and 6th Avenues. 1930-1939. Architect: Raymond Hood. Art Deco. Raymond Hood, as head of the team, bore the main responsibility for negotiating among the many interests to make "the City within a City" a reality in limestone. While speaking the language of cost and efficiency, he argued that Rockefeller Center needed roof gardens, open spaces, and works of great art if it was going to succeed. Almost everyone else at the time thought it was going to fail. 23. 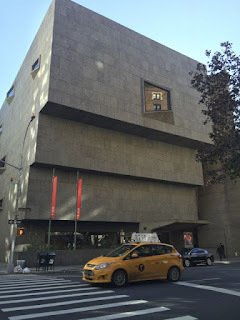 The Whitney Museum of American Art, 99 Gansevoort St. 2015. Architect: Renzo Piano. Contemporary Modern. Designed by Renzo Piano, the new Whitney evokes nautical and industrial themes while blending climate-conscious elements in its high technology. Spacious and open, the museum is a friendly space that invites improvisational walks and explorations. 24. Cathedral Church of St. John the Divine, 1047 Amsterdam Ave. 1892 groundbreaking; multiple states of completion in 1941, 2001, 2003 (fire), 2005 restoration begins. Architects: Christopher Grant LaFarge and George Lewis Heins; Ralph Adams Cram. Gothic and Romanesque Revival. 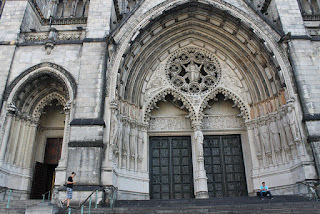 Extraordinary in scale, the cathedral of the Episcopal Diocese of New York is the fourth largest cathedral in the world and a wonder to behold. Its Gothic nave is the longest one in the country, and indeed a great walk can take place within the walls of the church. Aside from worship, look for an opportunity to hear a concert here. 25. The Ellis Island National Museum of Immigration, Ellis Island, part of the Statue of Liberty National Monument. 1900 Main Building. Architects: William Alciphron Boring, Edward Lippincott Tilton. Renaissance Revival. Worthy of a day trip, follow the steps of immigrants who entered the United States through Ellis Island. Take a guided tour and take one on your own. 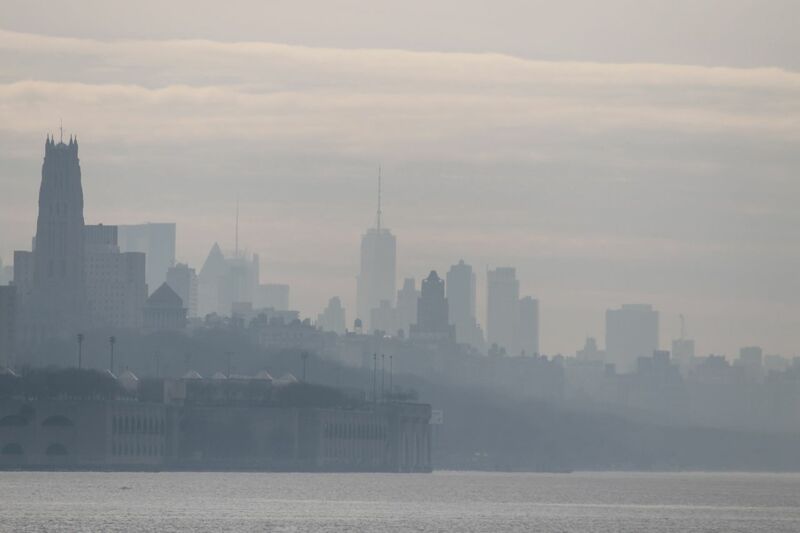 A trip to Ellis Island often includes a visit to the Statue of Liberty. Notes on walking: In Manhattan, many of these buildings fall within a straight line down the middle of the island from Central Park to 34th Street. For an uplifting exercise, choose two or more buildings and take a walk to see them. Images by Walking Off the Big Apple. Some of the text has been repurposed from previous posts.